“Mom, I don’t see a puppet stage!” That’s what the boy said when I started one of my shows at a rural library in Nevada a few years back. It seems the librarian had billed the multicultural storytelling program as a puppet show. When I booked the program, I mentioned that I might bring along a puppet to add a bit of interest for the audience, and it seems the librarian surmised that if I brought a puppet, I would be doing a puppet show. Oops. My heart sank when I saw the boy’s disappointment. I knew I would probably not be able to completely satisfy his expectations.There I was with basket in hand ready to tell a few stories and this little boy felt short changed before the show started because he did not see a puppet stage. Things didn’t settle down for him until my puppet, Clyde, came out of the basket to charm the socks off him and everyone else. It was a hard lesson for me to learn. From that day on, I have been very careful to let my customers know they are booking a storytelling program, and that I might include a puppet during the performance, but I will not be bringing a puppet stage for this show. LESSON: It is extremely important to be very clear about what it is that you do as an artist. 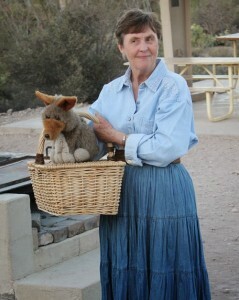 Performing with a puppet without the benefit of a stage is known as the lap puppet technique. This is a delightful and easy option for a storyteller to add something a little extra to a program. When done well, the show moves along quickly and a high level of interest is maintained. As a rule, the puppets I use in these shows are seldom seen at the start of a performance. They are usually hidden inside an interesting container – sort of like waiting in the “wings” (inside a basket, small suitcase, lunch box, colorful bag or decorated box), until it is time to come out and meet everyone. When the puppet has finished a brief appearance, he tells the audience he has to do something (like find a book, take a nap, practice a story), and he tells the audience “good bye for now.” As I put him back into the basket (or other holding place) I reassure everyone he will come back at the end of the show, and he always does! To pull this off and to be convincing I think of each of puppet as a real personality: I believe in every puppet I work with, and my belief translates to an acceptance of each character by the audience. If my puppet is a talker, I provide the puppet’s voice as well as my own. I am, in fact, talking to myself in two distinct voices. Since I am not a ventriloquist and I do not pretend to be one, my mouth moves as the puppet speaks. Believe it or not, this works and is not the distraction one might assume. Sometimes the puppet I use does not talk directly to the audience. Instead, he communicates by whispering into my ear and I repeat out loud what he says to me. This whispering puppet is a trickster, reacting in a positive way if I get things right, and in a negative way if I don’t “get it.” This puppetry “bit” is a crowd-pleaser. Everyone has a grand time when the puppet’s foolishness works and I am caught off-guard by his tricks. His behavior usually creates a bond with the audience, and everyone wants to know how the puppet will fool me next. If you intend to work with a lap puppet, be sure to practice a lot and take time to create a unique character, attitude and “voice” for each of your puppet partners. Always remember to respond to everything your puppet does and says. To create an earnestness and believability in what takes place between the two of you, look directly at the puppet when he speaks and make certain that he looks at you when you talk. Eye contact is also important when a puppet talks to the audience. So pay close attention to where your puppet looks when things are going on during a show. 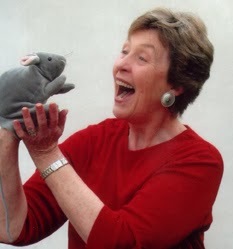 A lap puppet is convenient and easy for a storyteller to use and is not necessary to take, set up and tear down a puppet stage to add a little puppet fun to a show. Using a lap puppet is a great way to add interest and energy to almost any storytelling event. Just remember to make certain your program is not billed as a puppet show, or you may find yourself working harder to win over an audience with an expectation you are not prepared to meet. PreviousStorytelling and Puppets (Can They Really Work Together?) NextFizz and Boom!